Why? Why did this happen? Jenn Fang is sick and tired of Bill O’Reilly’s commitment to the Model Minority myth, and wishes Jon Stewart had challenged the FoxNews star more effectively, and with more nuance. I guess because Bill Maher’s battle of wits (in absentia) with Ben Affleck over Maher’s latent Islamophobia went viral and Jon Stewart could be having none of that, Stewart invited on Fox News anchor Bill O’Reilly last night ostensibly to promote O’Reilly’s newest book — something-something-General-Patton-no-one-cares — but really with the singular goal of getting Papa Bear to admit the existence of White privilege (video after the jump). And, if that was Stewart’s goal, he failed utterly at it. Instead, what we were left with was an incoherent 12-minute sputtering contest between an avowed liberal so flabbergasted by conservative obstinance that he was rendered largely speechless, and a Fox News anchor who looked for all the world like he was being held hostage on set. Unsurprisingly, when asked to defend his disbelief in regards to White privilege, Bill O’Reilly once again ran straight to the Model Minority Myth; I’ve already written an entire post as to why Bill O’Reilly’s last invocation of the Asian cultural canard is as wrong as it is racist. 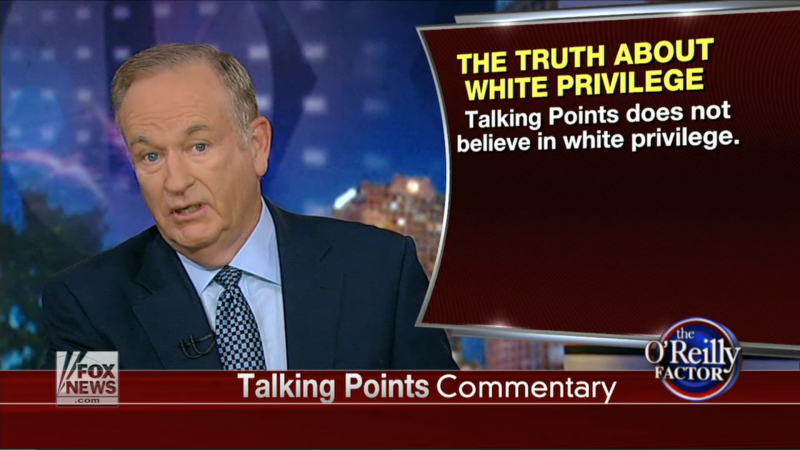 On the Daily Show, O’Reilly’s basic argument is that if White privilege exists, so too must Asian privilege. To back this up, O’Reilly cites the high median income of Asian Americans versus other racial groups ($71,709 for Asians, $56,203 for Whites, and $35,564 for Blacks). Since these statistics appear to show that Asian Americans as a whole make more money, O’Reilly concludes that either Stewart must acknowledge the existence of Asian privilege or neither White privilege nor Asian privilege must exist. And, thinks O’Reilly, since Asians are people of colour and liberals never cross minority special interest groups… Checkmate!? Stewart fails utterly at presenting a nuanced summary of the Asian American diasporic politic to Bill O’Reilly; instead he walks right up to the edge of where a good counterargument exists and then inexplicably falls flat on his face. (“What kind of Asians?” asks Stewart. “Asian Americans,” responds O’Reilly. “Depends on where they’re from?” They’re from Asia!”. Stewart is rendered speechless, although to be fair, that was also the point at which I face-palmed so hard I left a mark.) And, in a world where Asian Americans make up less than 3% of those appearing even as guests on political talk shows, it’s not entirely surprising that there was no Asian American (or indeed no person of colour at all) to help salvage this travesty of a Whitesplaining moment. So, since my request to Bill O’Reilly’s publicist to have Papa Bear appear on the next episode of Reappropriate: The Podcast is still pending, here’s everything Jon Stewart should have said and didn’t. Whether or not one agrees that Asians experience some limited degree of skin privilege in very specific sectors of the workforce, Bill O’Reilly’s citation of median household income by race to assert a general Asian privilege is profoundly flawed. First of all, median household income is calculated by combining the aggregate incomes of all residents into a single household pot, with the basic assumption that everyone’s household is the same size. Yet, this is simply not the case: Asian Americans have among the largest household size of all races with an average of nearly 4 adult members per household compared to Whites, who have the on average the smallest households at 2.55. So, Asian American median household incomes are approximately 20% higher than Whites’, but with nearly twice as many people contributing their incomes to the same pot, indicating that median household income statistics grossly overestimate Asian American earning. When one considers, instead, the per capita income of Whites vs. Asians — that is, the median income per person rather than per family — the stark gap in annual salary narrows to a mere $3,000 difference ($28,000 for Asians vs $25,000 for Whites). …accounting for regional costs of living [for Asian Americans] would lead to adjusted estimates of per-capita income that would be significantly lower for Asian Americans than for whites. Furthermore, the disadvantage faced by Pacific Islanders would be even starker than what we find in the case of per-capita income without cost-of-living adjustments. This quote highlights the final problem with citing an aggregate median household income statistic to make monolithic (and monolithically wrong) pronouncements about the Asian American community: Asians Americans aren’t just generic “people from Asia” (as O’Reilly retorts). I mean, does O’Reilly not realize that Asia isn’t a country but a continent encompassing roughly one third of the world’s landmass? The Asian American and Pacific Islander political identity consists, in reality, of a diasporic coalition of people whose experiences are more varied and distinct than one homogenizing number could ever reveal. As Stewart tries, and fails, to point out, the AAPI communities include not just Chinese Americans and Indian Americans — two groups whose median incomes are among the highest in the country — but also a range of ethnic communities whose economic indices scarcely reach parity with the US average, including: Samoan Americans, Cambodian Americans, Hmong Americans and Laotian Americans. Statistics reveal a broad spectrum of economic and educational outcomes across this range of ethnic groups, most of whom are at or below the national average even while not accounting for geographic stratification — remember, again, that most of these AAPIs are found in states with higher overall costs of living. These ethnic differences in household or per capita income arise almost entirely related to a single factor: American immigration policy. Roughly two thirds of AAPI are foreign-born; thus, it’s not hard to agree that immigration policy has a prominent influence over the demographic makeup of our community. The vast majority of “high achieving” AAPIs are comprised of ethnic groups whose entry into America occur predominantly through work- or education-based visas (or as the immediate family of those entering through such visas); thus, the apparently high median income of these groups is largely a consequence of an immigration policy that selects for immigrants with high existing education or economic capital with which to invest into measures of achievement. Meanwhile, AAPI ethnic groups with below-average median income are overwhelmingly Southeast Asian Americans or Pacific Islanders, who arrive with limited access to educational or economic opportunities in their countries of origins, and may include a higher proportion of immigrants entering as refugees, and thus lack the same advantages selected for by America’s work- and education-based visa programs. Meanwhile, O’Reilly simply ignores a host of other factors that would contradict his argument regarding Asian and Asian American affluence. While overall poverty rates are low among AAPIs, senior poverty rates are twice as high among Asian Americans as Whites, and poverty rates are growing by as much as 36% in parts of the AAPI community including among women and children. Asian American unemployment rates are low, but our rates of chronic unemployment are second highest in the country. And while Asian Americans are well-represented in a variety of tech industries, ongoing discrimination produces both a “bamboo ceiling” against professional promotion and depresses earned income relative to White and non-White peers. In the end, O’Reilly isn’t going to stop using his one flawed statistic about median household income (in ignorance of all the others data that complicate his argument). What should be more worrisome is how he’s making a flawed point: one that is based entirely upon a misunderstanding of the word “privilege”. For Bill O’Reilly, privilege and affluence appear to be synonymous terms. Hence, O’Reilly’s rebuttal of White privilege involves invocation of Obama and, more specifically, Oprah — Oprah’s wealth, in O’Reilly’s mind, negates any possibility that African American women might be underprivileged. O’Reilly goes on to point out that there are many economically underprivileged White people in America, as if this were some meaningful counterargument against White privilege. The problem is, quite simply, that privilege and income are not equivalent. Oprah can give away cars on her show and still be racially profiled in a retail store. Meanwhile, Whites (and Asians) can still grow up in households that earn thousands of dollars less than affluent Blacks and Latinos in California and still have better access to higher quality schools than their wealthy underrepresented minority peers. Even the most impoverished White family still enjoys the benefits of skin privilege, which includes both the privilege of not being Stopped-and-Frisked (or shot to death) under the assumption of colour-coded criminality as well the greater likelihood of being born in traditionally White enclaves (like O’Reilly’s Levittown) that enjoy the benefits of higher educational capital and government investment. And, while O’Reilly is correct that no one is forced to live in ethnic enclaves anymore, O’Reilly fails to account for the latent cultural factors that continue to limit entry into traditionally homogenous neighbourhoods. Non-White families that attempt to integrate a predominantly White enclave like Levittown must first accumulate the resources to undertake a move, find local employment opportunities, and oftentimes defy local cultural resistance to their entry. The latter obstacle cannot be underestimated; ironically, the first African American family to attempt integration into another Levittown found themselves at the epicenter of a riot. Thus, not suprisingly, only 11% of Americans undertake a move annually, and just under half of those for housing-related reasons such as entry into a better home or neighbourhood. O’Reilly’s hometown of Levittown, half a century after the end of overt racial segregation, remains 95% White. That is the cultural residue of redlining. Meanwhile, Bill O’Reilly’s stubborn refusal to acknowledge his own skin privilege would be far less obnoxious if he would stop using Asian Americans as his model minority cudgel with which to chastise other groups, and Jon Stewart’s sputtering would’ve been far less obnoxious if he had thought to invite an AAPI and a few other people of colour to contribute to the debate over the minority experience. Instead, two White men got on camera to spend a quarter of an hour to tell us all about racism. But this is America, where White privilege doesn’t exist, right? Originally appeared at reappropriate.co, reprinted with full permission. Jenn is a proud Asian American feminist, scientist and nerd who currently blogs at Reappropriate.co, one of the web's oldest AAPI feminist and race activist blogs. She has previously contributed her writing to Change.org, Asian Pacific Americans for Progress, Asian Americans for Obama, and The Nerds of Color. She can currently be found primarily at Reappropriate, as well as on Twitter at @Reappropriate.